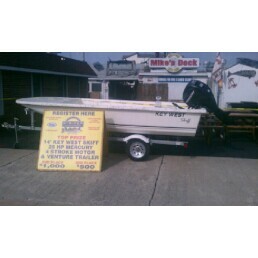 “The soon to be premier striper tournament at the Jersey shore.” The grand prize for the top 3 heaviest stripers is a 14 foot key west skiff boat with a 15Hp mercury 4 stroke motor and trailer. There will be 2nd and 3rd place cash prizes. There is a blue fish category and a youth prize also. The Calcutta is a 50/50 for autism. The tournament will be held the 11th 12th and 13th of November. On Sunday the 13th there will be an awards banquet and seafood buffet with great raffles and door prizes at the Lobster loft restaurant. For more information stop by the Store, Mikes seafood or the Lobster Loft hear in Sea Isle City or call (609) 778-8418 Deadline for registration is November 3rd at 7pm.